It seems that the stabilization in the Eurozone, even potentially a temporary one, is having a healing effect on the global economy. We've seen some indications of improvement in China (see post), but now there are also positive signs in Brazil's economy. A great deal of that improvement is driven by a highly accommodative monetary policy and the recovery remains quite slow, but it's progress nevertheless (see discussion from July). Brazil's industrial production, though still weaker than expected, came in positive on a year-over-year basis for the first time since August of 2011. Reuters: - Output from Brazilian factories and mines expanded 2.3 percent in October from a year earlier, government statistics agency IBGE said on Tuesday, though less than the 2.5 percent rise forecast in a Reuters poll of 33 analysts. Industrial production dropped 3.6 percent on a year-over-year basis in September, IBGE said, revised from a 3.8 percent drop. "There is a gradual recovery happening," said Jankiel Santos, chief economist with BES Investimento in Sao Paulo. "Bit by bit we are getting more signals of it and today's numbers confirm it." October's figures were the first annual rise in industrial production since August 2011, when Brazil's central bank began a series of interest rate cuts aimed at protecting Latin America's largest economy from the effects of a global slowdown. The November indicators also register improvements in Brazil's growth. 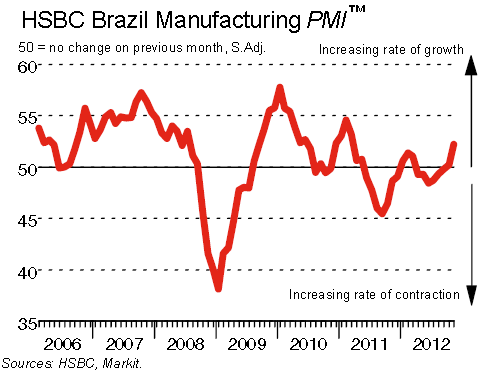 The HSBC manufacturing PMI is showing Brazilian output beginning to grow again. 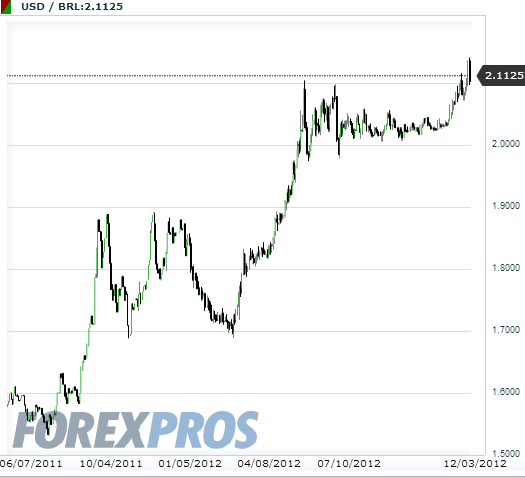 One significant factor helping Brazil has been its currency weakness. The dramatic decline in the Brazilian real over the past year makes Brazilian products more attractive, particularly versus natural resource competitors such Australia, whose currency has been relatively strong (see discussion). Whether intentional or not, devaluation helps in certain cases. Of course Brazil may be facing inflationary pressures as a result, but that's a topic for another day.